Vintage is a busy time of year. Ripening rapes in the vineyard are assessed continuously for sugar levels and acidity. When they are ready bunches are picked, with a team of neighbours and friends, and moved to the winery. The winemaking starts. 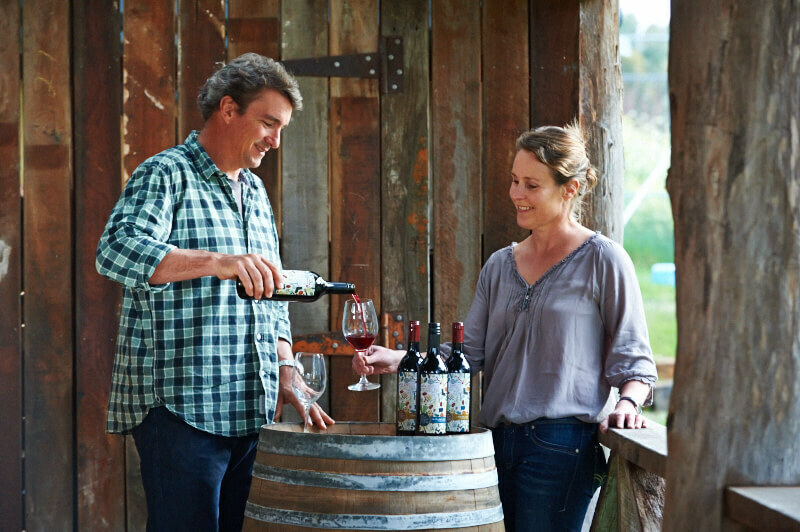 Our zinfandel grapes are crushed and de-stemmed into fermenters where indigenous yeasts begin to digest the sugar and the transformation of grape juice into wine begins. Over 10 days we plunge the cap of skins back into the fermenting juice every four hours to ensure it forms part of the ferment. The next process, once the fermentation is almost finished, is to pump free run juice into barrels, leaving the skins behind. These skins still contain wine, which has to be pressed out. Our press is a simple “basket” style, one of the oldest ways of extracting the juice. It is basically a cylinder of timber battens, spaced to strain the juice out from the solids as pressure is applied. Originally the press had a mechanical geared screw device that was hand-cranked to press downwards and extract the wine. This was an arduous process. As the wine came out the pressure reduced, and more cranking was necessary. There had to be a better way. A lot of improvements in a winery come at the cost of the use of electricity to power processes. Often the tools of the past were simpler, cheaper and easier to manage than a shiny new plug-in solution, but we tend to overlook them as a real option. Levers are older than Archimedes, who alluded to their power by suggesting that with a long enough lever, and a place to stand, he could move the world. All we wanted to do was press some grapes. Some lengths of timber, some bolts, a steel post and a bit of welding later we had our lever press. The lever uses the weight of a water filled wine barrel at one end, and a chain block controlling the height at the other, to press down the grapes at the basket. The spacing means that around four times the weight of the barrel is concentrated at the press. This means over a tonne of weight gently and continuously presses down to force the wine out of the skins. The biggest benefit? We no longer have to crank the press. Gravity and physics do all the work while we watch the wine flow. 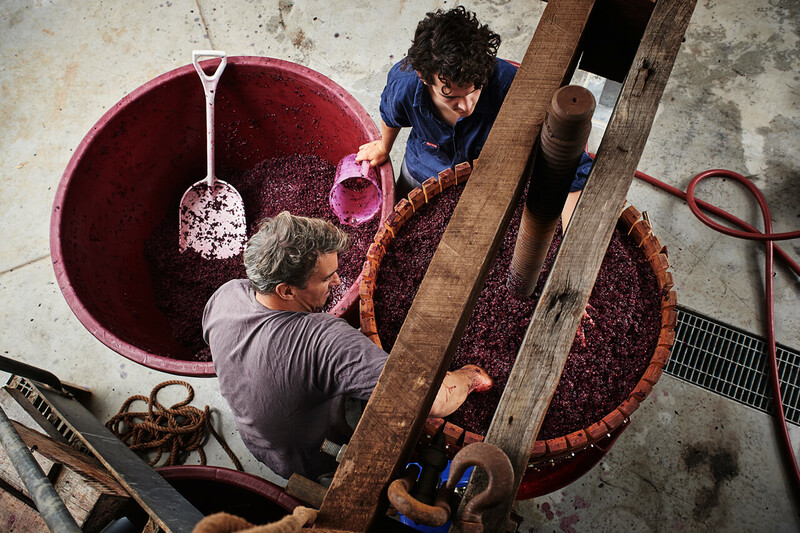 What used to be a heavy physical process has become a contemplative interlude in our winemaking. The only sound is the creaking of the press and the splash of juice.